sa - G. & A. Nousias G.P. has consolidated its leading place in the Greek market while guaranteeing products second to none. As a result, the products’ §superior flavor and exceptional quality have been instrumental in the subsequent international success of the company. 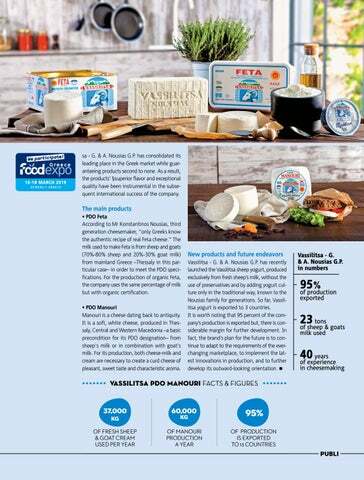 The main products • PDO Feta According to Mr Konstantinos Nousias, third generation cheesemaker, “only Greeks know the authentic recipe of real Feta cheese.” The milk used to make Feta is from sheep and goats (70%-80% sheep and 20%-30% goat milk) from mainland Greece –Thessaly in this particular case– in order to meet the PDO specifications. For the production of organic Feta, the company uses the same percentage of milk but with organic certification. • PDO Manouri Manouri is a cheese dating back to antiquity. It is a soft, white cheese, produced in Thessaly, Central and Western Macedonia –a basic precondition for its PDO designation– from sheep's milk or in combination with goat's milk. For its production, both cheese-milk and cream are necessary to create a curd cheese of pleasant, sweet taste and characteristic aroma.